Following our Arsenic in Rice post, we decided to put our recipe skills to the test and come up with a delicious rice-free milk for you. So many supermarket non-dairy milks contain rice or are sweetened with rice malt syrup, so now we have a quick easy alternative. 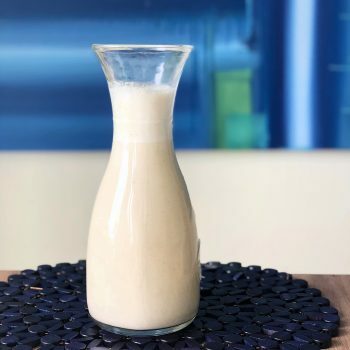 Our delicious and nutritious Cashew Milk recipe can be easily whipped up in a blender or Thermomix. This recipe doesn’t require straining (like many other nut milks), which cuts down on mess and means you won’t be left wondering what to do with all that left-over nut pulp. This Cashew Milk is super creamy and can be adjusted according to your personal preferences; if you like a thinner milk, add an extra cup or so of filtered water. If you prefer a thicker and creamier consistency, you can reduce the water content as desired. We’ve listed some of these suggestions below the recipe in the Variations section, but the great thing is you can customise this recipe as you wish! Add to the blender, along with 3 cups of filtered water and the dates (remove the pips first!). Blend until smooth; in the Thermomix, blend on 10 for 2 minutes. For a thinner milk, add extra water (begin with ½ a cup extra and increase from there). For a thicker, creamier milk, start with less water (e.g. 2 or 2 ½ cups). For a flavoured milk, add 1 tsp of vanilla extract or ½ a tsp of cinnamon. For a Chocolate Cashew Milk, add 1-2 extra dates and cacao powder to taste. PS: This Cashew Milk goes great in Dandelion Chai tea and doesn’t separate in the tea like many other non-dairy milks!